So my fellow Vampire Loving Dorks and other random blog readers, you may have noticed that since the end of True Blood, posts around here have been a little quiet. That is not because I have run out of random things to say, but has been more a question of my “Real Life” with children heading back to school etc etc, doctor’s appointments, and various other things getting in the way. But here I am and as you can probably tell from the title my musings today maybe even more off the wall than normal because I am quite deeply entrenched in my alternate geek loving persona. Now many of you that follow me know well of my vampyric obsession and love of the darker side of life…. but only those closest to me know that this love also transcends into the vast geekdom of science fiction with things such as Star Trek, Firefly, and of course Doctor Who. Now I have a question that has been running around in this little insane asylum (also known as my brain). When we talk about hooking new people onto new vampire shows or books we often talk about “turning them” or being their maker. Well right now I am on a crash course “turning” people into Whovians. Sharing the addiction to the Doctor should come with titles and fun little things that are shared only within the clique that knows them. But what to call it? Do we “Convert” them like the Daleks or the Cybermen? Or “Assimilate” them like the Borg? And even then what title does the “Maker” then take on? It is not as though we can call someone “A Davros” for example? So where, you may be asking, has this geek girl persona been hiding for all this time? Well she hasn’t. If you read back there are often vague references to other shows that hook me in and the one thing they have in common is all the hidden clues. Things that mean little to nothing in the one-off episode but as you go through the series you see that the answers were there if you just knew how to unlock them. That is the geek side of me that is always floating around be it obsessing about True Blood, Looking for Firefly references in the latest episode of Castle, debating meanings from the latest in a series of books, or right now trying to decipher the messages hidden in the Doctor Who episodes. I am especially excited at the moment as I have managed to turn my husband into somewhat of a Whovian and my lovely Lauren is definitely a work in progress. MORE people to obsess with (even though they don’t always know WHY the words are important). 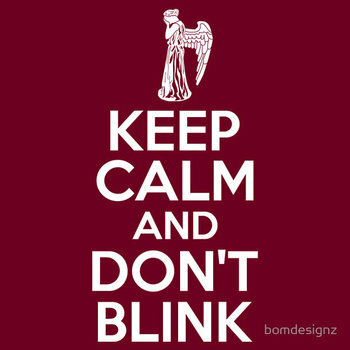 Hmmm At this point I think I have to thank the Weeping Angels for without them I don’t think this “conversion” would have been successful. Dorks, Geeks, Nerds, all supposed to be insults but to me they will always be terms of affection that I embrace. Why else would I have labelled myself the VampireLovingDork? I know my obsessions are quirky but they are mine and I own them! Which links me nicely to the Karma that I have always so honestly owned. I have always said that I am happy throwing darkness into the Karmasphere and willing to take what comes back because I am a dark person and I believe that the light from my friends often balances out some of the Karmic debt but this time Karma managed to get in a little revenge and it came in the form of a Cheerleading Competition! A room filled with peppy teenage girls and their perhaps more annoyingly peppy parents was what I was forced to endure for several hours this weekend while my 13 year old Cheerleading daughter endured (I mean entered) her first cheerleading competition. Somewhere in my history there must have been a dormant “Pep” gene that has been activated for this generation. My daughter is totally academic, popular, and above all PEPPY which she has topped off this year by becoming a cheerleader. Now she still loves vampires, serial killers, and the weirdness side of things (Gary from Alphas for example) but somehow she manages to balance all this with the more normal side of teenage that I completely missed. It certainly makes for an interesting dynamic I can assure you but I do love the look on her friends faces at some of the darker aspects that come out of her mouth around them for like me she seems to lack a filter. Amusing as all that is it did not prepare me for what can only be described as Karma’s Revenge as I sat through 4 hours of happy, peppy, annoyance with my sanity (which generally is only hanging by a thread) being maintained by my wonderful husband who endured 4 hours of snarky comments and my wonderful Facebook friends who saw the humor in my torture.